Enlarge image in new window. 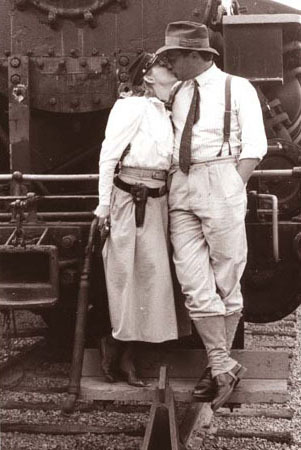 "...A favorite of me and my wife on a steam locomotive caught off guard by Screaming Weasel. Screaming Weasel never spoke, only screamed whenever his name was mentioned during the show. It was also implied that this character was never actually an Indian, but a not so bright white man doing a very poor job of playing an Indian." Contact Mark Osterman (aka Dr. B. Barabus Bumstead).